Happy Thanksgiving! 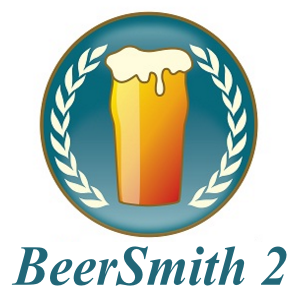 I’ve just released BeerSmith 2.2, the latest version of BeerSmith for Mac, PC and Ubuntu Linux. 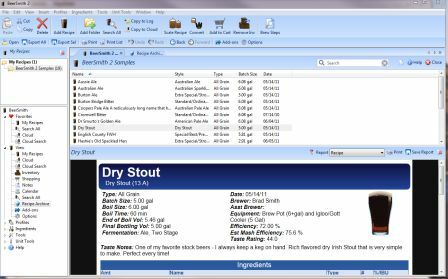 BeerSmith 2.2 features a cleaned up interface, new brewing features, and makes it easy to search and use thousands of recipes available on our BeerSmithRecipes cloud site. I’ll be publishing videos on the new features shortly and also a mobile update to take advantage of the new features soon. A lot of users said BeerSmith 2 looked too cluttered to them. So for 2.2 I’ve tried to simplify things by hiding the ribbon bar (though you can still turn it on from the view menu), and adding a simple list of views on the left side. The list of views can be customized to show your favorite views on top, and you can add or delete new favorites by right clicking on a view and using the add/delete popup menu there. You can further customize items from the view menu – for example moving to small icons in the main icon bar to make it more compact or hiding the shortcut or preview windows. 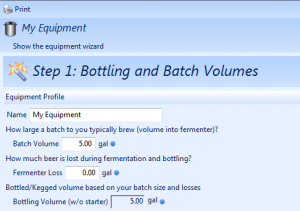 Setting up an accurate equipment profile is very important when starting to use BeerSmith. I’ve added a new Equipment wizard to help people just starting out who want to create a good profile to match their equipment for use in their recipes. You can access the new wizard from the Equipment Wizard command on the Insert menu. Once you have your equipment set up you can simply choose it in recipe design view, or set it permanently in the Options->Brewing dialog so it will be used for all new recipes. You no longer have to go to BeerSmithRecipes.com to do a web search for cool recipes, then try to download and open them. 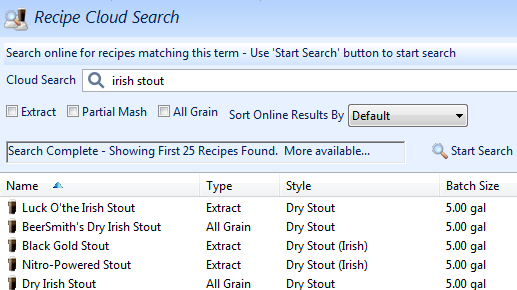 Like the mobile version of BeerSmith, our desktop version now has an integrated cloud search. Just open the new Cloud Search tool from the View menu and type in a few words to search nearly 10,000 recipes online. If you find one you like you can preview it, and use the new Copy Local button to save a copy to your local recipe folder. Assuming you have a good equipment profile, you can then use the Scale Recipe tool to scale it to match your equipment and go straight to brewing it from there. BeerSmith 1.4 had a nice tool for searching all of your local recipes at once for specific ingredients or combinations of keywords. 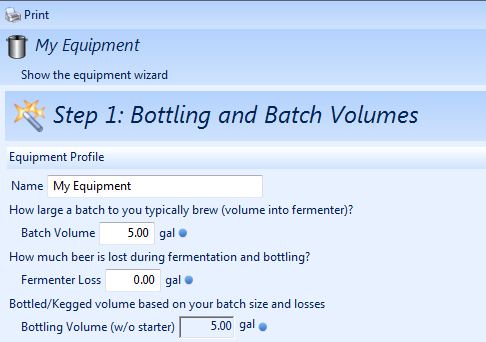 BeerSmith 2.2 adds this feature back in, though it is simpler to use. The new Search All view on the View menu lets you find specific terms including ingredient names, styles or recipe names easily. To find all of the recipes using Hallertauer hops, just enter Hallertauer in the search box and it will list them. You can also use multiple terms or ingredients such as “Hallertauer, Munich” to find all recipes using either Hallertauer or Munich malt, and there are tools to narrow it to recipes containing all or only some of the search terms. After quite a bit of research, I’ve finally added IBU contributions for steeped/whirlpool hops. If you mark a hop addition as steep/whirlpool it will now estimate the hop IBU contribution from that addition. The default is to add approximately half the IBU contribution of a similar boil time hops based on a steep/whirlpool temperature of 90 C, though you can alter that percentage in the Options->Bitterness tab. I’ve also added a new checkbox in the fermentables/grain editor for unfermentable items such as maltodextrin and lactose. If checked, the item will still be used when calculating OG, but will not be attenuated when calculating final gravity. This should give a better final gravity estimate for recipes that use these ingredients. These two items (whirlpool IBUs and unfermentables) are not yet implemented in the mobile version so your numbers may differ slightly, but I plan an update in a few weeks to the mobile versions to add these new features. Previous versions had limitations on report formatting and printing. The new version adds full HTML 5 with CSS styling to both the preloaded and custom reports as well as the “beer glass” display. This means that the recipe reports and brew steps sheets have a modern style to them now, and also those of you who create custom reports have all of the CSS styling options available. I’ve also improved previewing of many items such as the “Brew steps” report which now appears in a separate tab instead of a hard to read popup window. Printing is also improved due to the additional styling and formatting options available. People occasionally make mistakes such as editing a recipe they did not mean to change, or deleting some they meant to kept. 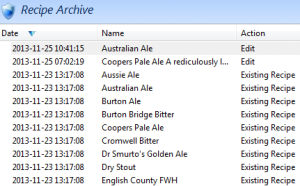 So BeerSmith 2.2 adds a new recipe archive feature that actually stores every single edit, delete or move of a recipe made on the desktop version. It records the date of the change, action performed and a copy of the recipe at that point. So now you can actually recover a recipe you may have altered or deleted very easily by going to View->Recipe Archive and finding the recipe you want to recover. I’ve added a new tool to help you adjust your original gravtiy if you are off after brewing. It will calculate how much dry malt extract or water to add to a recipe if your original gravity is slightly above or below your target gravity. This is just a partial list of all of the updates. In addition I’ve implemented a large number of bug fixes, easier cloud integration using the Copy Local and Copy Cloud commands, automatic checking and background download of updates, better proxy support and more. Thanks for all of your continued support of BeerSmith Desktop and BeerSmith Mobile. Have a great Thanksgiving and a happy Holiday Season! Thank you a lot for your work. Specifically the new gravity adjust Tool! Will raise an IPA tonight to you. Thanks for continuing to support Ubuntu Linux! My Recipes view in the report looks really nice! Appreciate the IBU calculations for whirlpool additions. The gravity adjust tool is nice to make a quick adjustment when repeatability is necessary. I have the mobile app and look forward to the update there as well. Still looking for a simple copy/paste feature for ingredients in the recipe editor. Would be so much easier to add a hop addition, modify its’ AA, then copy/paste the other additions and only need to edit the time points. Thanks for your continued development and work in our homebrewing community. Loving the integrated cloud search! This is a GREAT update. Thanks so much for all your hard work. I’ve been looking forward to the search by ingredients tool. I noticed that it seems to search text only, not numbers. For example, if I put in “Roselare” I get results of all recipes with that yeast. However, if I put in 3763 (the Wyeast #) I get no results. Is there a setting I can tweak to enable it to search numbers as well as text strings? The biggest improvement for me is the visible report function. I don’t know how many times I could not find the print brewsheet function in the old version. The new search function is also great. All I need now is a “what can I cook from the refrigerator” function where I can see what recipes I could make from just what ingredients I have on hand. I’ll correct this in the next update – it was supposed to pick up the yeast number but it looks like I made a mistake somewhere in implementing it. I started using BS2 pretty much when I started brewing, and I came close to giving up on it several times because of course much of it was beyond my scope of understanding at the time. Very thankful I stuck with it though, – I wouldn’t want to be without it now, and I’m sure the latest update will be better still! Thanks Brian – the video tutorials at http://beersmith.com/video do help a lot of people just starting out. And a Happy Thanksgiving to you Brad. Does this update include an option that will adjust relative calculations for steeping (instead of mashing) roasted grains? Can’t wait to check out the update when I get home, definitely going to brew a Black Friday Porter. The new version looks great! In doing some customizing for the view I noticed that the Insert menu items are not available in the Tabbed version of the Ribbon, nor are the available in the lower left Sidebar so that functions like Add Note can be added to Favorites. Hi – Yes I kept the new sidebar to just “views” to simplify. You can either turn on the full tabbed ribbon from the View menu (which brings back the old ribbon) or just use the selections on the Insert menu to add new ingredients and such. I applaud the improvements. I still don’t get bsmx files. On a Mac they export as a near unreadable text only document. Is there any way to send the recipe to a friend in the neat and organized version that shows up in Brew Steps? Is there a conversion already available within the program? Can’t wait to get back home, and update copy to 2.2. Recently, switched over BIAB for my all grain brewing and until things get tuned in a couple of these new features look especially useful! Thank you Brad. Beersmith continues to get better and better. You’re making our wonderful hobby easier than ever. 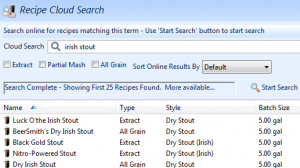 Love the ingrediants search feature and the updated Brew Steps report. Many thanks for the upgrade. It installed very quickly without any issues. I’ll explore the new options over the next few days, but I really like the modern look of the recipe page report. I’m using the Mac version. For me, I like the ribbon, especially when tabbed. What I can do without though is the Open | Export All | Export Sel | bar, which I can’t seem to hide. But it’s all minor things and doesn’t stand in the way of BeerSmith helping me make great beer. You can still turn the ribbon on – go to the View menu and select “Toggle Tabbed Ribbon” and the tabs will come back. 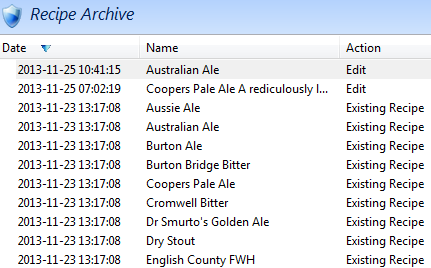 Mark – If they have BeerSmith you can export the files to a BSMX file and send that which they can open on their end. If they don’t you can use the “Save Report” button on the preview window pane in My Recipes to export just the report you are viewing. You can select a text report to make it simple or an HTML report if you want something more complex. Just installed the upgrade on Ubuntu 13.10, it’s feels much snappier than the last release. Good work! Would really like to see Android edition built in a more native fashion. The non-Android interface is keeping me away on that front. Just some honest feedback, hope it’s helpful. I was playing around with the update and it is really nice. One thing I noticed though was that when you select different reports, they show your mash grains and steep grains twice. The reports that seem to be affected are Brew Steps, Brew Process TXT and Classic Brewsheet. Jeremy – I actually posted a fix for this last night in build 2.2.07 which is on the download page. I’ve not posted this fix to the “check updates” yet so it won’t show up there yet but you can download it manually. Once I clean up one or two other reported bugs I’ll also post it as a “check update” for all. Paul – thanks – I’ll continue to work on the mobile versions as well to make them better over time. Looks good. Can’t wait to give the new version a try. Thanks for keeping the greatest homebrewing tool even greater!! A hearty thanks to you, Brad! Your dedication is commendable. Accidentally hid the menu bar, and now I can’t unhide it! How do I fix it? Thanks! You can “show” it by choosing “Show Menu” in the Options dialog, Look and Feel page. This is my favorite tool! We who are about to Brew Salute you! loving your work. I use BS2 on Linux Mint 14. I’m always interested in what comes out in the new builds. I’ve just installed 2.2.12. Can you post the complete change log for each release? For me the biggest bugbear is printing currently. Sorry – was making changes rapidly between 5 and 12 as some bugs were causing lockups/crashes. I added a new date format option (under Options->Units for build 12), corrected several crashes (build 11), corrected an issue where some people could not see anything in preview window (build 12), corrected a series of issues with startup screen and program hanging (builds 6-8), corrected auto-update on some 64 bit machines (build 11), and corrected a formatting bug (build 6). I think most of the major issues are resolved in build 12, but I’ll continue to correct items if needed. Could you make Beersmith support the Retina Display for Mac OS X? Thanks! Nice, really like the new brewsheet. I bought the activation keys yesterday, Nov 13, but have been able to download. New BeerSmith Tutorial Videos Available | Drinking Beer Inc!